So What Does the Solstice Symbolize? So what exactly does this Winter Solstice mean for us? First of all, let’s consider the fact that this year’s Winter Solstice occurs during a Full Moon. This in itself is significant, since it combines the powers of both the lunar and solar cycles. Many Pagan Paths establish their calendars based on the phases of both the Sun and the Moon – indeed, the year often revolves around the solar cycle with its solstices and equinoxes, which make up the four Lesser Sabbats of the year – Yule (the Winter Solstice), Ostara (the Spring Equinox), Litha (the Summer Solstice), and Mabon (the Autumn Equinox). These together with the Greater Sabbats of Samhain, Imbolc, Beltane and Lughnasadh make up the Pagan Wheel of the Year. The Sabbats are important days to most Pagans… a time for getting together to celebrate the changing of the seasons and cycle of birth, life, death, and rebirth. and adore the spirit of Me Who is Queen of all the Wise. So let’s examine this Winter Solstice a bit more carefully. To begin with, the Sun will transition from Sagittarius to Capricorn during the late afternoon/early evening hours, something it does every year on or around the solstice. 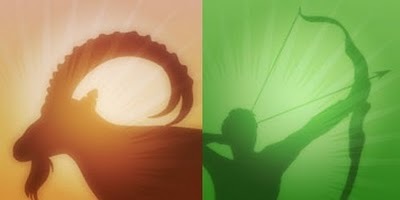 From the fiery flames of the archer, the sun moves into the earthy groundedness of the goat. Sagittarius is a fire sign – Fire rules the watchtowers of the South, representing the passion and spirit that motivates our will; that driving force to make things happen and create change. Capricorn on the other hand is an earth sign – Earth at the North watchtowers governs both our body and our budget; representing money, health, physical labor, work and employment. I used to think it was a little strange that at the time when we are celebrating the birth of the sun, the Sun itself is actually moving out of a fire sign (the sun being one of the principle symbols of the element Fire). But the more I think about it, it makes sense. Sagittarius represents that final month of pregnancy; as the Goddess with her full belly prepares to give birth to the child of wonder, who brings light and warmth to the world. 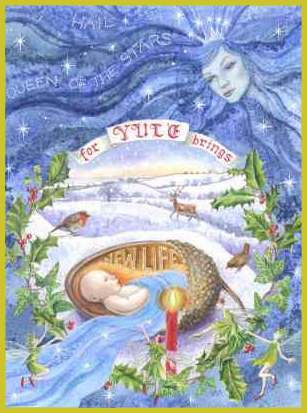 Once that child – the sun king – is born on the Winter Solstice, the Earth rejoices with the promise of hope and new beginnings. Thus the Sun moves into the earth sign of Capricorn, symbolic of that promise and of the planet’s celebration. When the elements of Fire and Earth combine as they do for however briefly during the Winter Solstice, the result can be quite powerful. Fire provides the initial spark to begin the action, while Earth gives sustaining energy to see such actions through to their result. In addition, those earthy energies can help to ground fiery inspirations; to help one stay steady, focused, and moving forward. No wonder the Winter Solstice is seen as a time for initiating new beginnings! By the same token, the Moon will also transition on December 21st, moving from the air sign of Gemini into the Water sign of Cancer. Air is the element of the East, and rules the mind and communication – learning, thinking, analyzing, writing, speaking (and yes, this includes signing! ), expressing. Water is the element of the West, and rules the heart and emotions – feeling, loving, caring, daring. 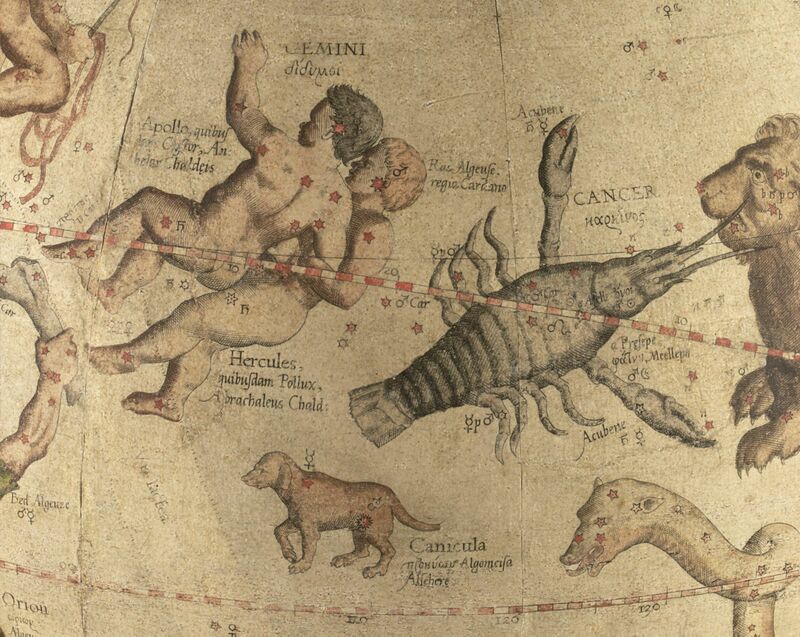 In Gemini we find the strong emphasis on thought, ideas, and intellectual pursuits; while Cancer provides the opportunity to get in touch with one’s feelings, and tune in with all the nuances and subtleties in your environment. This transition could create a feeling of being pulled in two directions – a struggle between mind and heart as you try to decide between the intellectual versus the emotional orientations of life. But in the end it all balances out, and one will come away from this solstice lunar transition with a mode of operation that encompasses both types of perception. This allows for a greater sense of depth to those ideas which like the pregnant Goddess, have been growing in the womb of your imagination over the past few months and which are now born into the new year. While you are able to attune to your feelings in making decisions and taking action, you also maintain the ability to detach yourself from those feelings and analyze them rationally when necessary. It is interesting to note that all four elements are represented in the solar and lunar cycles during the day of the Winter Solstice (albeit at different times of the day): Fire and Earth in the Sun, Air and Water in the Moon. For a person such as myself who works closely with elemental magick, I see this as a wonderful balance – bringing an even greater sense of hope to that promise of new beginnings. I am reminded of the phrase often repeated within many Pagan (particularly Wiccan) traditions: To Know, To Will, To Dare, To Keep Silent. From the lunar Air comes the knowledge necessary to think up new ideas; from the solar Fire we get the will to actually turn those ideas into action; Water from the moon’s cycle prompts us to actually dare ourselves to move forward with such actions and implement them; and finally the message of the sun in Earth reminds us to stay grounded and remain quiet, that we might thus attune our bodies to the energies of the universe around us. As we prepare for this year’s Winter Solstice, let us remember the powers of the elements, and honor the Moon and the Sun in their realm as the Goddess and God. Let us give birth to our own ideas, our own creation, our own self. Yes, I am aware that the Winter Solstice is also the time of the Lunar Eclipse, which in itself will be a powerful, magickal experience filled with much symbolism. But that’s a subject for a whole other post. I hope to publish something here at the Crossroads sharing some of my thoughts regarding the eclipse by the beginning of next week…stay tuned! The solstice has always fascinated me. Thanks for this great write up! Take care and may the sun and stars light your way! My daughter was born dec. 21st 2010 at 1838 hrs. Is that considered a lucky date?